VANCOUVER, BC – January 16, 2018 — Mirasol Resources Ltd. (TSX-V: MRZ, OTCPK: MRZLF, “Mirasol”, the “Company”) is pleased to announce the acquisition and initial exploration results from the newly recognized Zeus high-sulfidation epithermal (HSE) gold project located in the prolifically mineralized Mio-Pliocene age belt of Northern Chile. The Zeus project (Figure 1) comprises 18,480 ha of contiguous exploration claims. 15,980 ha of claims were staked by Mirasol as part of its Atacama-Puna generative program, and a further 2,500 ha of claims are controlled by Mirasol via a 5-year option to purchase agreement with the underlying property owner. Mirasol can acquire 100% of these claims by making staged option payments totalling US$2.75 million over the 5 years with US$2.45 million of the payments due in the 5th year of the option. The property owner will retain 1.5% NSR royalty. Mirasol has a right to buy 0.5% of the royalty for US$3.0 million. Mirasol is targeting large-scale bulk-mineable HSE gold mineralization at Zeus. 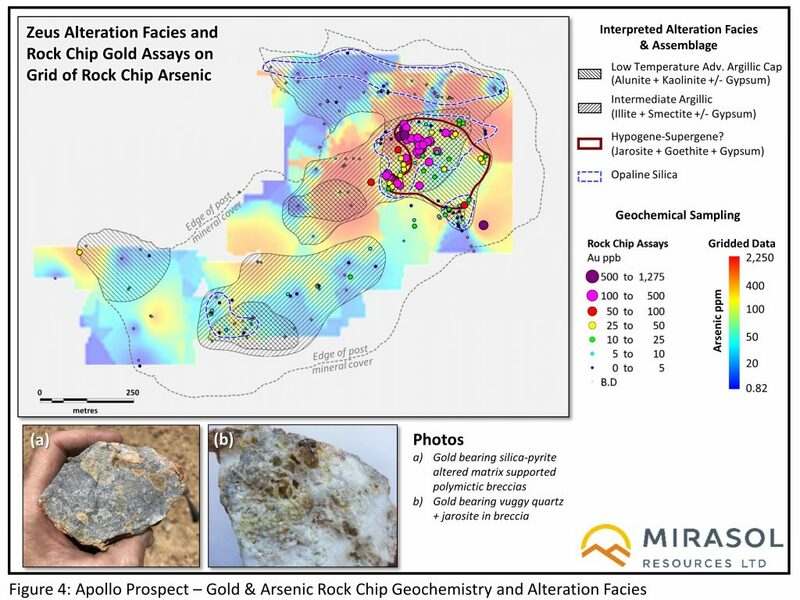 There has been no previous systematic surface exploration nor drilling at the Zeus project, where Mirasol has identified two large breccia-hosted gold targets at Artemisa and Apollo. The reconnaissance stage exploration results from both prospects are considered very encouraging for this early stage of exploration work. The next stage of exploration at the project is anticipated to include systematic soil sampling, geological mapping and rock chip sampling, as well as magnetic and electrical geophysical surveys. Once acquired, these data sets will be used to drive integrated analysis for drill target selection, anticipated by the end of this field season (late April 2018 to May 2018). Mirasol is actively seeking a JV partner to advance the exploration and drill testing of the Zeus project. 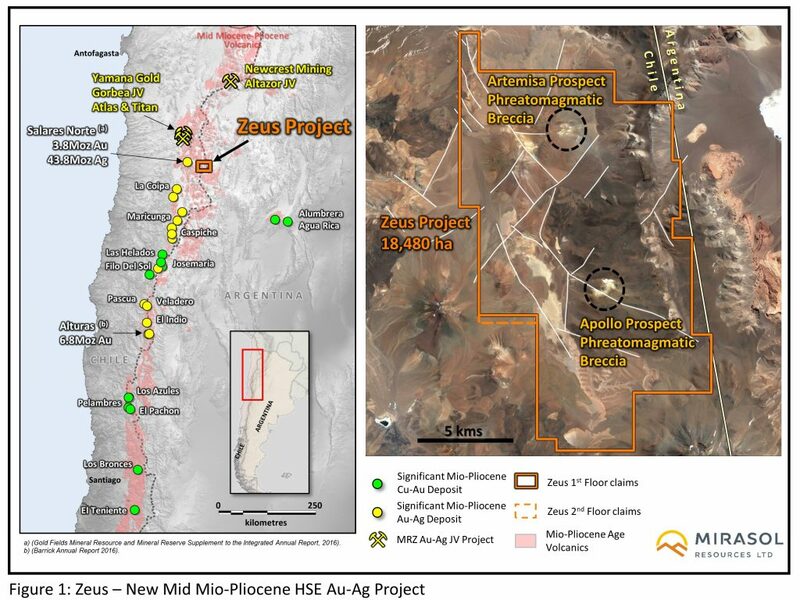 Zeus is located 40 km east-south-east of Gold Fields’ 3.8 million ounce Salares Norte1 HSE project along the trans-orogen Culampaja structural corridor, which is believed to have played a critical role in localizing a number of large-scale tertiary age HSE and porphyry copper gold deposits in Chile and Argentina. The two HSE precious metal targets at Artemisa and Apollo are interpreted to be twin phreatomagmatic breccia bodies. 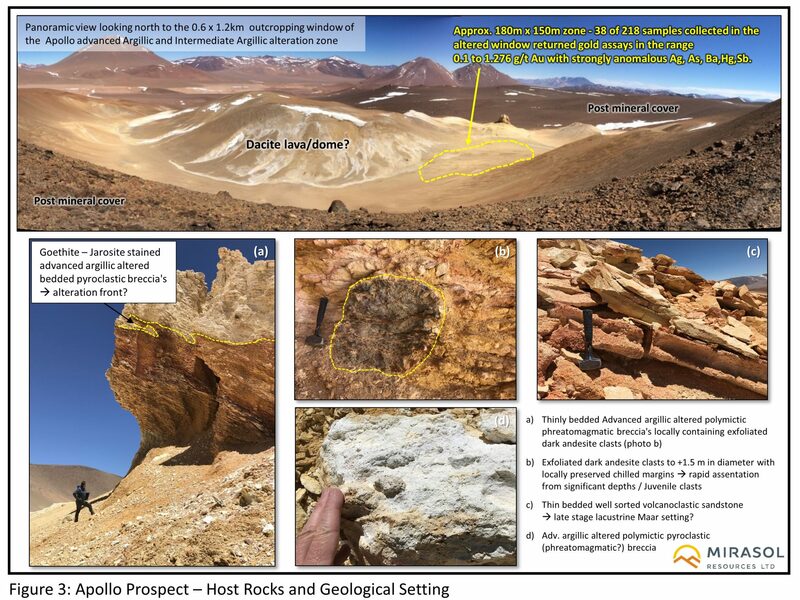 Brecciation plays an important role of rock preparation that facilitates later hydrothermal fluid access and may act as host rock to precious metal mineralization in large HSE deposits, such the new Mio-Pliocene Salares Norte and Barrick Gold’s 6.8 multimillion ounce Alturas2 discovery in Chile. 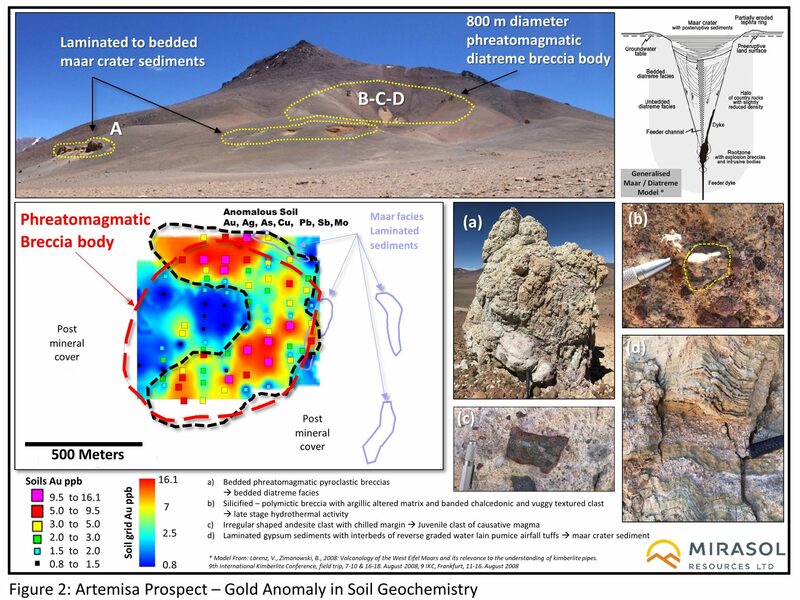 At Artemisa (Figure 2) Mirasol’s exploration has outlined an 800 m diameter advanced argillic altered breccia where reconnaissance level soil sampling has defined a low-level coincident Au, Ag, As, Cu, Pb, Sb, Mo anomaly, which overlies the edge of the mapped breccia body. The level of the geochemistry anomaly is similar to that seen at surface overlying the Salares Norte orebody3; at Artemisa this may represent geochemical leakage from a concealed zone of mineralization at depth. At Apollo (Figure 3) a 0.6 x 1.2 km wide crescent-shaped zone of advanced argillic and intermediate argillic altered pyroclastic breccias and epiclastic sediments outcrop through a window in post-mineral lava flows. This alteration is interpreted by Mirasol’s geologists to be hosted by a partially exposed phreatomagmatic breccia and flow-dome complex. Mirasol has undertaken initial mapping, rock chip sampling and alteration modelling from 218 samples recently collected throughout the Apollo alteration window (Figure 4). Assay results show wide-spread strongly anomalous Ag, As, Ba, Hg, Sb, with 38 of 218 samples collected in the altered window returning gold assays in the range 0.1 to 1.28 g/t Au. Gold mineralization reports to silica-pyrite flooded breccias, and oxidized vuggy quartz-jarosite breccias. Mirasol invites investors to follow the Mio-Pliocene HSE gold story by visiting www.mirasolresources.com and signing up to receive our news releases. 1 Gold Fields. (2016). The Gold Fields Mineral Resource and Mineral Reserve Supplement to the Integrated Annual Report 2016 (total resources including inferred of 3.8 M oz Au at 4.6 g/t Au and 43.8 M oz Ag at 53.1 g/t Ag). 2 Barrick Gold Corporation. (2016). Annual Report 2016 Alturas (6.8 M oz inferred resource at 1.00 g/t Au).